Designed for the petite beauty 5'6" or shorter, California Petite is the official state preliminary for the national competition, USA Petite. There is no minimum height or dress size requirement. Reflecting a diverse and more realistic demographic of women, California Petite is focused on recognizing the extraordinary ladies of The Golden State who believe age, height, lifestyle and ethnicity are never barriers when it comes to catching the crown. TEEN (13-17) - Must not be married or have children. MISS (18-26) - Must not be married or have children. MS (24-40) - Must not be married but may have children. MRS (30+) - May or may not have children. Married contestants younger than 30 will automatically compete in the Mrs. division. Winners automatically compete at Nationals, which takes place in Florida each fall. Winning at USA Petite means a free cruise the following year to attend the international competition, Universal Petite. USA Petite Teen & USA Petite Miss compete at this level, while USA Petite Ms. & USA Petite Mrs. get to come along for the ride, some R&R and to support their sister queens. California Petite and USA Petite do not have Talent portions. 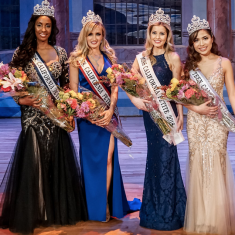 California Petite is open to all California residents and students who are living in the state for school during the time of the pageant, as well as the following year if they are crowned.